Cavities are one of the most common oral health concerns effecting both children and adults. While over ninety percent of people will have at least one cavity at some point in their life, what causes them, and how can you lower your chances of developing cavities? Dr. Brian Chan and his team at Classic Dental Smiles want to help lower the number of people who develop cavities by offering the best in preventive care treatments in the Rancho Bernardo, CA area. Cavities are formed when the outer area of your tooth is eaten away by plaque and tartar. Plaque is formed when sugary and acidic foods you consume combine with the bacteria in your mouth. Without regular brushing and flossing to remove the bacteria, they will begin to cause tooth decay. Once tooth decay has caused damage to the enamel of your tooth, you may have developed a cavity. If cavities aren’t treated right away, the tooth decay can become more severe and seep deeper into the root of your tooth causing further damage and intense pain. Generally, cavities caught early will be easier for your dentist to treat which is why it is important to have cleanings and exams regularly. If you already have a cavity, your dentist will need to remove the decayed areas of your tooth. Once all of the infected areas have been removed, they will use a white filling or porcelain restoration to fill in the affected area to help you avoid further tooth decay and infection. The best way to keep your teeth strong and healthy is by brushing and flossing regularly. By removing the harmful plaque from your teeth, it will make it harder for decay to form on your pearly whites. It is also vital to see your dentist twice a year for check-ups. 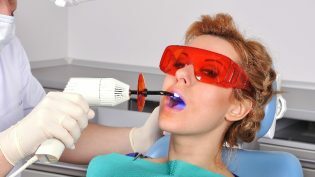 They will take a look at your teeth and determine if you are developing a cavity as well as giving you tips on how to avoid cavities in general. If you are in the Rancho Bernardo, CA area and would like more information on cavities and your oral health, please contact our office today to set up an appointment!